There was once a great RPG game called Exile, which quickly attracted scores of fanatical fans. Then came Exile 2 and then Exile 3. Even after that the series ended with Blades Of Exile, fans craved more entries. Finally after years of waiting, the game once known as Exile was perfected into Avernum. The games are essentially the same. The same world, the same characters and most importently the same story. The only difference from the two are that Avernum is a polished version of what the game designer Jeff Vogel first intended for his masterpiece. 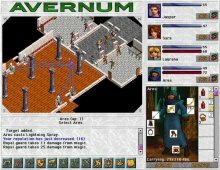 Avernum is set in an underground series of tunnels and caves called Avernum by those who inhabit it. To be cast down is to be doomed never to see the sunlight again. For there is no escape from the pit. The empire who controls the surface of the planet uses the caves of Avernum as a prison for those that do not fit in. Be it politicians with the wrong views. Peasents who complain about taxes and so on. All these undesirables are cast down to Avernum eventually. This of course spawns great hatred in the Avernites. The game is, simply put, huge. There are 3 main quests in the game: kill a great demon lord, find an exit to the surface, and most importantly kill the evil Emperor Hawthorne who controls the Empire and the surface. To accomplish these goals, you must first gain the trust of the good people of Avernum. This is done by accomplishing subquests to attain Reputation. Higher reputation means more people will trust you with more profitable quests and thus give you even more reputation and so on. The game has an amazing number of caves and dungeons. I spent two whole weeks playing this game and I seriusly doubt that I found all of it. There are also many different weapons ranging from swords to spears to the magicly imbued "Demonslayer" (my favorite) This sword is a must have if you wish to stand any chance against the Demon Lord Grah-Hoth. The spell system of this game is pretty straight forward. There is 20 different spells for both your mage and priest characters. These include heal, battle rage, cure and varius other offensive spells. Although at later stages you just end up casting divine restoration and Arcane blow. Combat is your average turn-based thing, where you attack, get attacked, throws spells etc. Nothing special.